MRSA PR01 was grown overnight under aerobic conditions in Tryptic Soy Broth at 37°C. DNA extraction was performed using MasterPure™ Gram Positive DNA Purification Kit (Epicentre, Madison, USA) as per manufacturer’s instructions. The concentration and purity of resultant DNA was assessed by UV spectrophotometry (Nanodrop, Thermo Scientific). 5 µg of genomic DNA (A260/280 = 1.88) was used for library preparation. The genome sequence was obtained using 104 Mb of paired-end (300 bp spacing) data from the Illumina GAII x platform (Illumina, San Diego, CA) with 36-bp reads. Sequence data were assembled using CLCBio Genomics Workbench (CLC bio, Aarhus, Denmark). One hundred and ninety-five contigs (N50: 13,272 bp) were generated, and were overlaid with the reference sequence Mu50 using OSLay. Fourteen supercontigs were generated as a result. Gaps were closed using Sanger sequencing. Visual representation of the MRSA PR01 genome. From outer to inner tracks: Scale (in bases); annotated CDSs colored according to predicted function (red, SCC element; blue, genomic is-land; green, transposon/integrative conjugative element; purple, S. aureus pathogenicity island [SaPI], brown, prophage); forward strand CDS; reverse strand CDS; GC skew. Initial analysis of the genome revealed several key features. 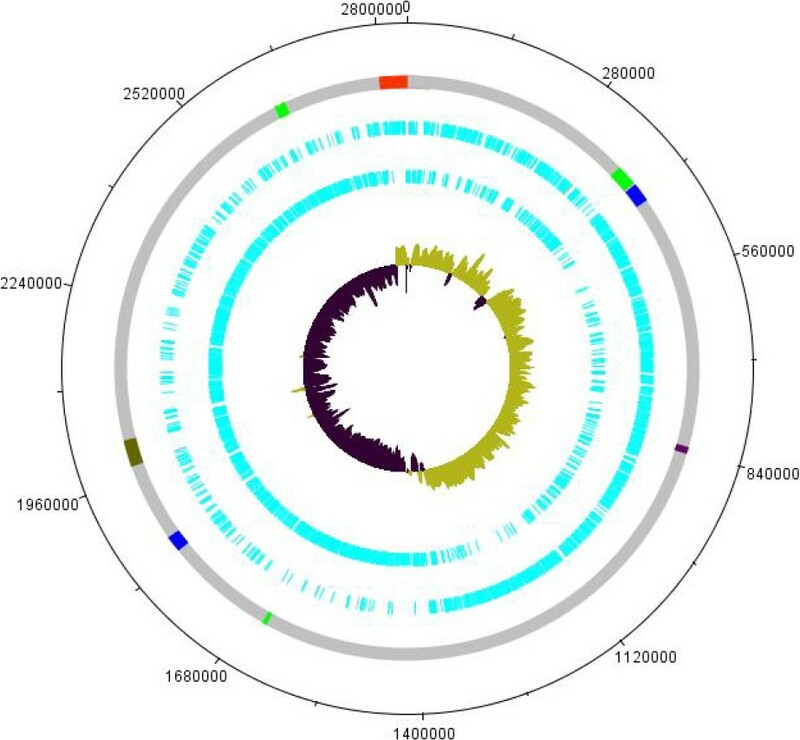 This genome has a typical SCCmec type III cassette, containing cadmium resistance genes. SCCmec type III is a composite element that is comprised of SCCmec and SCCmercury. In the MRSA PR01 genome, like others, this region harbors ccrC, pI258 and Tn554 as well as the genes involved in cadmium resistance. The MRSA PR01 genome contains two pathogenicity islands, and several resistance features were identified such as the qacA gene, which confers resistance to antiseptics such as cationic biocides, quaternary ammonium salts, and diamidines via an export-mediated mechanism, and the norA gene which confers resistance to hydrophilic quinolones such as norfloxacin and ciprofloxacin. There were 9 regions defined as prophage regions by PHAST  with one complete prophage region.genes were identified in the genome. A total of 2,267 genes (72.66%) were assigned a putative function. The remaining genes were annotated as hypothetical proteins. The properties and the statistics of the genome are summarized in Table 3. The distribu-tion of genes into COGs and KEGG functional cate-gories is presented in Table 4. Strain AST-10T is rod-shaped with size of 0.2–0.4 µm × 0.5–1.2 µm. It is an obligate anaerobe and oc-curs singly. The temperature range for growth is 15–35°C, optimum at 30°C. The pH range for growth is 6.5–8.5, optimum at 7.0–7.5. The salinity range for growth is 10–60 g L−1, and optimum at 30 g L−1. Strictly chemolithoautotrophic growth oc-curs with H2, HS- or S2O32− as an electron donor and with nitrate as an electron acceptor. Nitrate is reduced to N2, and reduced sulfur compounds are oxidized into S0 or SO42− (depending on molar ratio of S2O32−/NO3−). The major cellular fatty acids are C14:0, C16:0, 2-OH C16:0, C16:1, C18:0, and C18:1, with C16:0 2-OH as a unique fatty acid different from other spe-cies in the genus Sulfurimonas. Dr. Lin Cai thanks The University of Hong Kong for the Postdoctoral Fellowship. This study was finan-cially supported by the Research Grants Council of Hong Kong (HKU7201/11E).